About once a decade I go to a movie that is so bad, I cannot believe it was released. This was that movie. There is one good line at the end. "Pass"
It was hilarious, I’m a big Issa Rae fan too! Everyone can relate to being bullied! Fo the sake of comedy they took it to the extreme, but there were lessons to be learned! 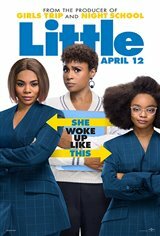 I was very impressed that Marsai Martin was an executive producer of the movie! Love the movie. It was very funny everyone laughed out loud. The acting was great and enjoyed the storyline. A must see movie. The movie wasn't very funny, even though it was billed as a comedy. The acting by all was solid. Everyone in the theater showed little or no response. The trailer was the best part of the movie. Cute!!!! The last part of the movie was the best part, Luke James, talent show, etc...………..
A real turkey. Decent actors but horrible dialog, meandering awkward plot, and trite message. The climactic success of the Issa Rae character isn't even shown at the end. They just skip to the celebration. Lame. This was a light-hearted fun movie with some great acting!In fact there were times when it was laugh out loud funny. Also, the young girl Masai was excellent as the main character. Trailer was the best part of this movie. Disappointing!